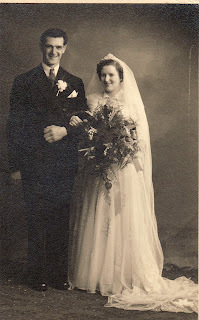 My mam & dad, Maxwell Scown & Freda Watson were married on March 27th 1954, at St. James' Church in Hamsterley. They lived in Wolsingham, first in the village, then up the hillside, Wears Bank. They rented a smallholding called Mount Pleasure when I was 3 months old, then moved a few hundred yards away to Rushylea 7 years later. We then moved to Ireshopeburn, to High Hotts Farm in 1969. They retired to Wearhead in 1994, where my mam still lives, dad died in 1999.